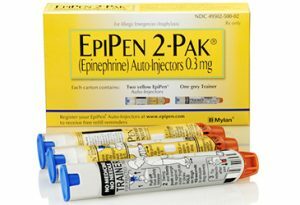 WASHINGTON — Facing a national shortage of EpiPens, the Food and Drug Administration has extened the expiration dates of certain lots of the life-saving allergy drug by four months. The extensions apply to the 0.3 mg dose of EpiPen and its authorized generic, with current expiration dates between April and December 2018, according to a statement from Pfizer, which manufactures the EpiPen for Mylan. The extension doesn’t apply to EpiPen Jr., which is used for kids weighing between 33 pounds and 66 pounds and provides half the dose of epinephrine. EpiPens typically have a shelf life of 20 months, according to the FDA, which said it’s allowing the additional four months after reviewing stability data provided by Mylan. The move comes as parents of children with allergies are finding EpiPens hard to come by in pharmacies as they stock up for back-to-school season. Last week, the agency approved the first generic competitor to the EpiPen, from Teva Pharmaceuticals, but it’s not expected to reach the market for a few months. The post FDA extends EpiPen expiry date to combat shortage appeared first on CDR – Chain Drug Review.